Passionate Journey by La Leche League International co-founder Marian Tompson is the story of a young mother who became known worldwide and was even referred to as “The High Priestess of Breastfeeding Mothers.” Written in a light and casual tone, many of Marian’s stories are familiar if you’ve read The LLL Love Story, Seven Voices, One Dream, or The Revolutionaries Wore Pearls. While theoretically a personal memoir from one Founder, rather than a history of LLL, because Marian’s personal history is intimately entwined with the organization’s history, the end result is very similar to existing books about LLLI. The writing style is simplistic and ironically often fairly dispassionate in tone, perhaps due to having a co-writer for a first person memoir. Chronology jumps are occasionally confusing. Several anecdotes made me laugh aloud and read them to my husband–such as a medical intern rushing to the physician after witnessing one of Marian’s three natural hospital births and exclaiming, “oh, doctor! How did you do it?” As a birth activist and feminist, I’m fascinated by the radical courage required at the time to support and promote home birth and breastfeeding. While LLLI has always been a “single purpose” organization, it has also always recognized something that seems to escape the notice of many professionals and consumers: that normal, undisturbed breastfeeding begins with normal, undisturbed birth. Tompson notes: “…having a baby at home is at least as safe as a hospital birth, and in most situations home birth is safer. New sciences and new research are helping us understand why giving birth in your own bed, surrounded by people who care for you, where you feel supported and can celebrate the birth, rather than just endure it, changes both the experience and the outcome.” Tompson had her first home birth in 1955 and went on to have three more children at home. Her daughters carried on her legacy, one of them returning to the family home to give birth to her own daughter. The Tompson family home was also the site of multiple family weddings as well as the almost unheard of home funeral for husband Tom in 1981. In a nice touch, reflective paragraphs from each of Marian’s seven children close the book. An inspirational story of the twists and turns of an ordinary life with an extraordinary global impact, Passionate Journey reminded me of the deep importance and transformative influence of providing support and encouragement to women who wish to breastfeed. 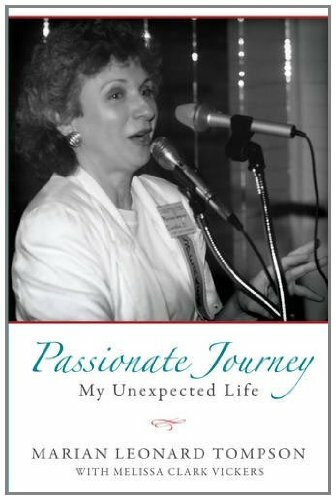 via Goodreads | Passionate Journey: My Unexpected Life by Marian Leonard Tompson – Reviews, Discussion, Bookclubs, Lists.